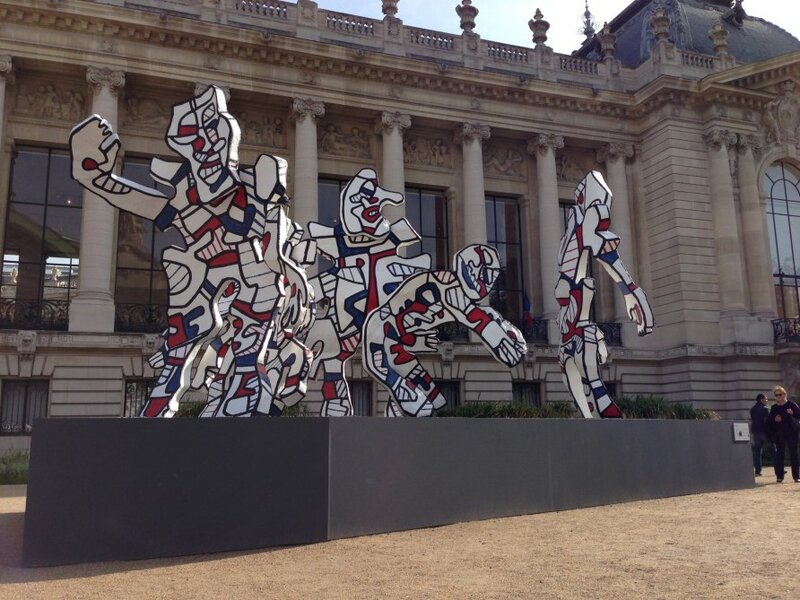 Jean Dubuffet's unique, monumental sculpture Welcome Parade is being exhibited in France for the first time. Made in 2008, in collaboration with the Dubuffet Foundation, this sculpture is based on Dubuffet's 1974 maquette in the Foundation's collection at Périgny-sur-Yerres. The group of five figures, titled 'Le Facétieux', 'Cherche-Aubaine', 'L'Accueillant', 'L'Incivil', and 'Rédingoton', the largest enlarged to four metres tall, epitomise Dubuffet's Hourloupe cycle. Jean Dubuffet originally conceived this sculpture to welcome visitors to the new East Building of the National Gallery of Art, Washington D.C., designed by I.M. Pei. The temporary installation of this monumental group, opposite the Grand Palais, will be on display from the beginning of FIAC until 1 December 2013, as part of the events surrounding the exhibition about Coucou Bazar (1973), at the Musée des Arts Decoratifs, from which Welcome Parade originates. Pace Gallery and Waddington Custot Galleries are the exclusive agents for the Dubuffet Foundation to which the artist gave all his architectural maquettes with a view to monumental realisations.